Genderwatch: covers over 300 titles from an array of academic, radical, community and independent presses on issues related to gender and women’s studies, and gay, lesbian, bisexual, and transgender (GLBT) research. Researchers may access more than 219,000 full articles on wide-ranging topics like sexuality, religion, societal roles, feminism, masculinity, eating disorders, healthcare, and the workplace. Gary Watt, Dress, Law and Naked Truth: A Cultural Study of Fashion and Form (London: Bloomsbury Academic, 2013). Wil Waluchow & Stefan Sciaraffa, eds., Philosophical Foundations of the Nature of Law (Oxford: Oxford University Press, 2013). John Keown & Robert P. George, eds., Reason, Morality, and Law: The Philosophy of John Finnis (Oxford: Oxford University Press, 2013. Rose-Marie Belle Antoine, Offshore Financial Law: Trusts and Related Tax Issues, 2d ed. (Oxford: Oxford University Press, 2013). Pádraig McAuliffe, Transitional Justice and Rule of Law Reconstruction: A Contentious Relationship (Abingdon: Routledge, 2013). Hy Bloom & Richard D. Schneider, eds., Law and Mental Disorder: A Comprehensive and Practical Approach (Toronto: Irwin Law, 2013). Julien D. Payne & Marilyn A. Payne, Canadian Family Law, 5th ed. (Toronto: Irwin Law, 2013). Greg Hagen et al., Canadian Intellectual Property Law: Cases and Materials (Toronto: Emond Montgomery, 2013). S. Patricia Knight, Small Claims Court: Procedure and Practice, 3d ed. (Toronto: Emond Montgomery Publications, 2014). Theunis Roux, The Politics of Principle: The First South African Constitutional Court, 1995-2005 (Cambridge: Cambridge University Press, 2013). 2 opportunities to learn to use RefWorks citation management to organize your sources: PDFs, books, articles, web pages and more. Nominations are now open for the 2014 Innovative Dissemination of Research Award. Established by the Library in 2010, this Award focuses on new and innovative ways of communicating and disseminating knowledge. The Award honors UBC faculty, staff and students who are expanding the boundaries of research through the creative use of new tools and technologies that enhance the research findings being disseminated. The recipient, announced in early spring 2014, will receive a framed certificate and a $2,000 cash prize. The deadline for applications is November 25. For more information, including eligibility, criteria, application forms and past recipients, visit the Scholarly Communications website. Please join us for a talk sponsored by Rare Books and Special Collections at UBC Library. The Oxford English Dictionary is one of the longest-running academic projects in history. Commenced in the early Victorian period and funded by Oxford University Press since its inception, it represents a grand achievement in English letters. As such, the OED commands a lot of prestige: when completed in 1928, no less illustrious personage than the British prime minister was the guest of honour, and Oxford University bestowed honorary degrees upon its publishers. As with any large-scale project, fair criticism can be hard to come by—one may take for granted that the OED is the apex in the field. While such claims may be hard to defend today, due credit must be given to a project that has navigated any and all rough seas for over one and a half centuries. 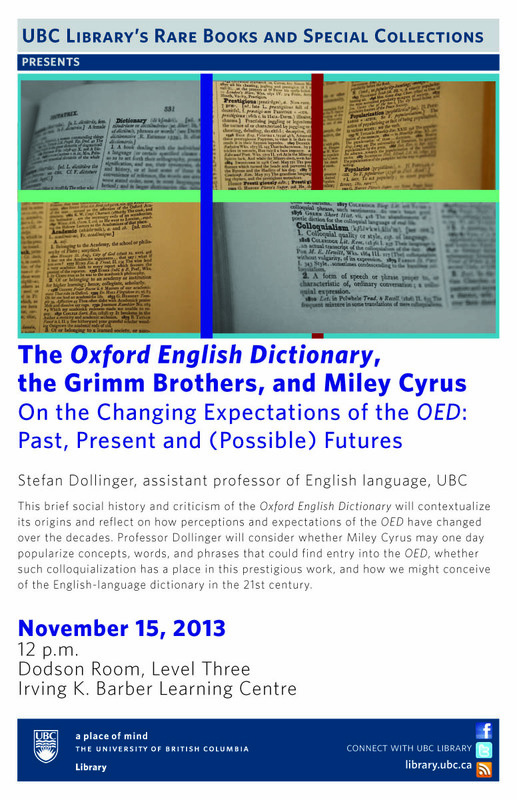 Professor Stefan Dollinger will offer a brief social history and criticism of the OED. Contextualizing its origins, he will consider how perceptions and expectations of the OED have changed over the decades. Today, the OED is popularly considered to list all English words, from William Shakespeare to Miley Cyrus, though such comprehensiveness was never its goal. While Miley Cyrus has as yet little to contribute to word coinage, her current notoriety and media exposure creates the possibility that she may one day popularize concepts, words, and phrases that could find entry into the OED: or shouldn’t they? This potential exemplifies the colloquialization and popularization of the OED that has already commenced. Beyond the impact of individual celebrities, the major question concerning the OED today revolves around how to conceive of the dictionary in the 21st century. Now that English is spoken by (far) more second language speakers than first language speakers, will the OED adapt to the new realities? For more information, please contact Rare Books and Special Collections at 604 822-2521 or rare.books@ubc.ca, and visit the exhibition The Road to the OED: A History of English-Language Dictionaries from November 7-December 24, 2013.